I would like to import all the sequence and then animate fadeIN fadeOUT for each frame. i can find anywhere documentation to create Animation sub-group with properties. Also i would like to put all the sequence OBJ in one root GROUP so it wold look cleaner. Nice result, glad to see the script came in handy. Sadly I don't think you can do what you have planned with all frames loaded as geometry in one tree. I am not sure if you could do this via view-sets or not, and then i have a sneaky suspicion that view-sets are not open to scripting. The reason you can't add all the frames in a tree is because they would all be in the one world space and would overlay each other. You would also need heaps of RAM. The cross fade should be doable via materials, but I would personally favour a non linear video editing suite. NICE, thanks for the quick answer. I know that this approach is very RAM consuming but for small animations, with a large amount of non animated object, i think it would take advantage of the realtime work of KEYSHOT. I have modified your script to import all the OBJ at the same time ;-) here what it looks like. I have thought using view-sets but a s you say not sure it can be animated. 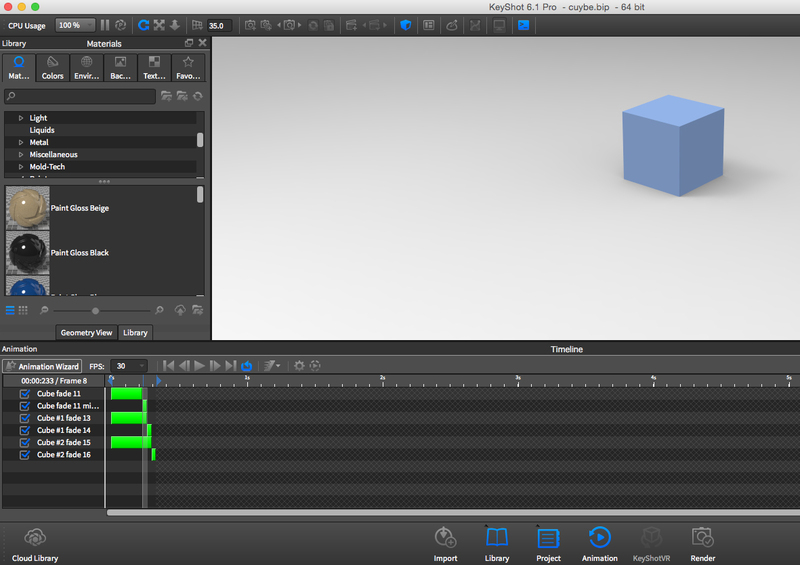 I have made a little test with cubes animated through fade animation (it works) but it is very tedious. maybe if i can not use a script to create an animated fade i will use the duplicate function used by the RANDOM SCATTERING script of luxion. As you can see in the screen capture it is not easy to animate fideIN fadeOUT I have to use two animated strings. 1. Create Objects Group ready to receive your frames. Keep iterating through importing OBJ's as you go and then either stop on the last OBJ or keep going until all OBJ objects have been imported and that all OBJ's have material template that has 0% opacity assigned to them. If you check under the Textures/Opacity Maps, there are enough maps there to give you like 1/2 second of fading animation (13 frames) so you should be on frame 13 or 14 when OBJ1 goes invisible. Hope this helps you some more ... Keep us posted, you have my curiosity tweaked now. Clearly i don't express myself that well in english. sorry i speak in french. You are right the (NFB) national board film of canada look is really cool but that is not what i am trying to achieve. i would like to be able to scroll through the animation pan so i can see an animated character move into my shot. the character is never the center of the shot (more something to get the scale) the kind of shot in the new star wars or new sci-fi film. i used to work with electric image or c4d but keyshot is so fun, impressive to work and so easy with Zbrush. saying that, it is very sad that keyshot does not offer animation to hide/show keyframe. I understand it is the very beginning for animation with keyshot. i do not know how you managed to script. information is so hidden. What i really want to do is to write a script that CREATES an animation keyframe to scroll through OBJ sequence visibility. The NFB image was to show that keyshot is able to load all the OBJ without crashing. Your input is very appreciated. It is not possible to edit animations via scripting. I Just checked the forum thread you created, and can not add anything to the conversation. For now i am afraid your goal can not be achieved in a sufficient way." So i had to find a "non-script" solution for my problem. fortunately KeyShots documents are opentext so is fairly easy to modify. I have created an XCODE app to implement an iterative small object (a plan) with visibility animated into an empty KeyShot document. The last step is use a modified script of Martin Spencer-Ford's version to update all iterated geometries and voila !!! KeyShot is a great software, see the shadows and occlusion updating in real time !!! I was expecting some non-fluid behaviour but the the software reacts as a charm. when you have time is it possible to create kind of tutorial? i`m sure it would be helpful for folks. I am not responsible for this, the original poster and problem solver was Guy. I am hoping to return back to coding and KS6 once i have completed my Jeep model. I have no idea on time span though because my home life is somewhat different than most. Any update on the possible script? I am trying this exact method, but with hundreds of frames. This would be timely animating a fade for each part consecutively per frame. I haven't had any ram issues. Any tips for scripting something up with camera pan would be ace thanks!